The ILVE Majestic series is a premium collection of Italian range cookers built to impress and perform, and it is targeted principally at the US market, where it does very well indeed. European customers considering the Majestic should bear in mind that the sizes mostly conform US standards, so will be wider and deeper than European models. For convenience, on our website we list products by their nominal width, 90, 100, 120, 150 etc, but you should always look at the actual width given in the specification table. Generally this would be slightly under the nominal size, but with Majestic it may well be over. This size difference is not a problem for most people - a new kitchen can be planned around the cooker, and only if you have an existing gap to fill will you need to make any width adjustments. The 70cm depth of the Majestic should not be deemed a problem either, as even if it is slotting into a line of 60cm deep units (the standard in the UK) the way the cooker presents itself forward of the line actually works very well. This range is very much a focal point of any kitchen, and this nicely emphasises the fact, with the rounded front corners helping this along. Height-wise, the Majestic Roma models with their cylindrical legs are adjustable generously under and over the UK standard 90cm height, but the Majestic Milano has more shapely legs with only enough adjustment to allow for levelling up - 915 to 920mm - so you may like to set adjacent units to match this taller-than-standard height. You can opt for these legs with the Roma, too.
. In the meantime you can find the Majestic 100 HERE. You should of course remember to check that you can get your Majestic range into the house and into the kitchen - check that door openings are wide enough and that you will be able to turn around any corners you need to. It may sound obvious, but we have certainly encountered cases where this has not been considered, and doorways have had to be temporarily widened or the cooker simply returned - not what anybody wants with a built-to-order range cooker, we can assure you! This is a heavy cooker, and not the easiest thing to manoeuvre, so make sure you have prepared the way by moving any obstructions, taking up or protecting any floor coverings, and keeping the cat well out of the way. A joy to behold, the ILVE Majestic is a real treat for any enthusiastic cook - a veritable dream come true. On larger sizes you can choose hob features to suit your style of cooking: large simmer plate, fry-top, barbecue grill, induction zones, or simply more gas burners - the choice is yours. 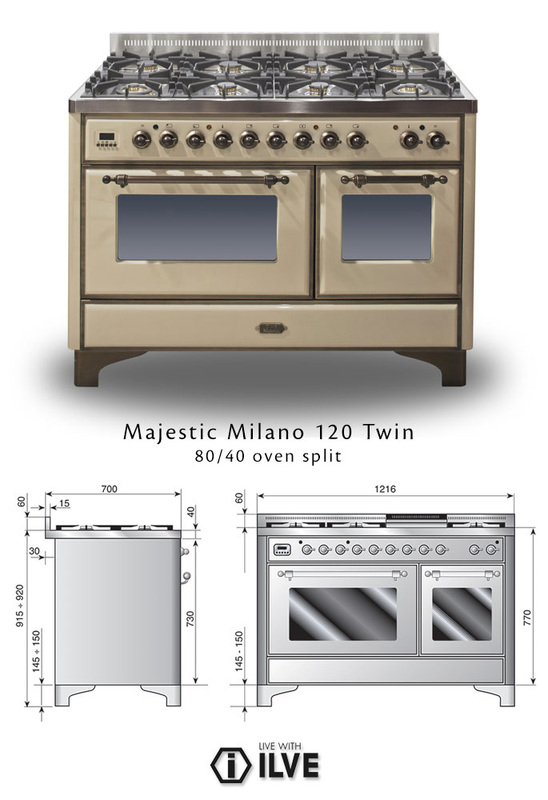 The Majestic 120 Twin also comes with a choice of oven split, a 90/30 for those who love a huge main oven, or a 80/40 for those who want a more usable auxiliary oven. Two styles are available, the more restrained modern Majestic Roma or the unashamedly heritage-rich Majestic Milano. Each is available with the same range of features and options, in nominal widths of 70, 80, 90, 100, 120 and 150cm. 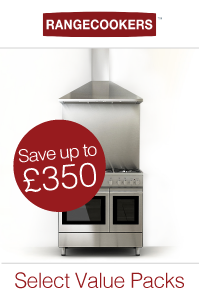 Matching hoods and splashbacks are there to complete the look, and it all adds up to a superb cooking platform which provides a fantastic heart to your home.